Welcome to our online reservation system. To schedule an appointment with Dana Prieto - Master Injector, please use the drop down menus on the left. 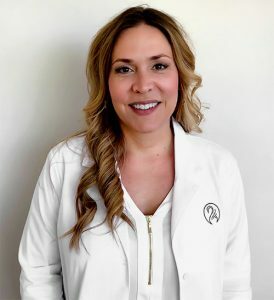 Our resident Master Injector, Dana Prieto, joins us with years of experience helping patients feel great about the way they look. Though she was born and raised in Houston, Dana has called Atlanta home for over 14 years. After finishing her undergrad at Florida State (Go Seminoles! ), Dana worked in cardiac intensive care before deciding to return for her Master of Science in Nursing with a specialty in Family Practice at Kennesaw State University. After earning her Masters, Dana worked for a year and a half in family practice at Minute Clinic before deciding to move to aesthetics. She loved the idea of focusing her care on wellness and being your best self—and she never looked back. As a previous patient of The Swan Center, Dana didn’t think twice when asked to join the team. When she was a patient, she was blown away by how phenomenal her experience was, and she couldn’t wait to join such an outstanding group of practitioners who were devoted to holding themselves to the highest caliber. At the Swan Center, Dana provides injectable treatments and specialized skin care to patients. She loves listening to each patient’s unique goals and being able to deliver beautiful results, knowing she has helped change their life in a positive way.